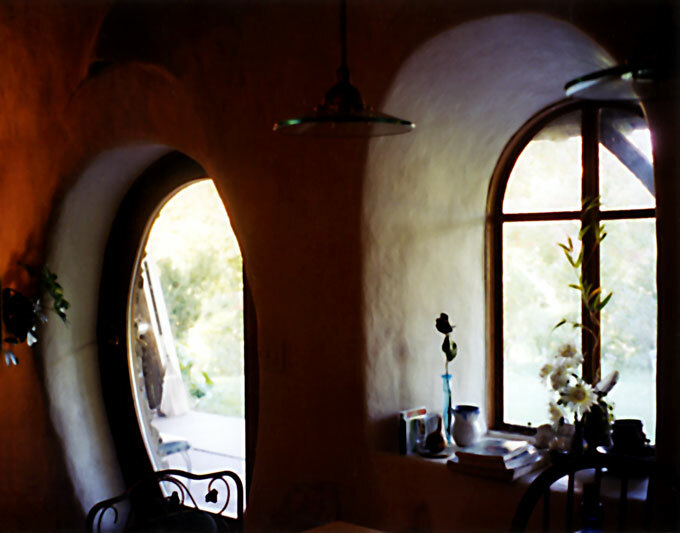 Looking out a window and door of a stone home in East Meredith, NY, built by Clark Sanders, builder and teacher of strawbale, cob, and other natural materials. Homes committee, wrote that “fussy, trendy, anachronistic rooflines, cupolas, and turrets [in] contemporary subdivisions are palliative attempts at endowing these spiritless developments with aesthetic substance.” Inside, occupants spice up bland interiors however they can. By contrast, the stimulating charms of pre-industrial, “old-world” construction and indigenous architectures include a nonuniform visual character inherent in the materials and processes used. The irregularity of the underlying materials contributes in unexpected ways to both finish and structure. Light catches and plays on hand-plastered walls; subtly imperfect floors offer sensory interest; unusual corners lend variety. Combining this aesthetic with excellent thermal performance, longevity, occupant comfort and satisfaction, and a keen eye toward deep environmental concerns—and the ability to do it cost-effectively—is a challenge that the natural building movement endeavors to meet. But an aesthetic appeal is certainly not the only driver—many natural buildings are virtually indistinguishable at a glance from normal construction; they have flat walls, distinct corners, normal roofs. This is true of contemporary and historic examples alike. This article takes a look at the resurgence of natural building over the last decade. It looks at some of the movement’s current underpinnings, emerging aspects, and philosophies that are of interest to the broader mainstream green building community. See sidebar for a brief description of many of the more common natural building materials and techniques.